Wharf Colliery was situated on the northern side of a loop in the river Goyt and to the west of the London and North Western Railway line, to which it was not connected. There was a bridge across the river, which was possibly used for the disposal of waste. This colliery was sunk in 1855-60 and initially it was worked by Thomas Boothman & Co and then by Levi & Elijah Hall, the last owner being Levi Joseph Hall J.P. The shafts were sunk in a field called Wath owned by John William Jodrell and occupied by Richard Robinson. It was still open in 1935 but its date of closure is uncertain. The name, Wharf Colliery, is something of a misnomer as it was situated about 550 yards distant from the wharf at the head of the Whaley Bridge Branch Canal. However, its name does at least suggest that some of its output was transported by boat on the Peak Forest Canal. 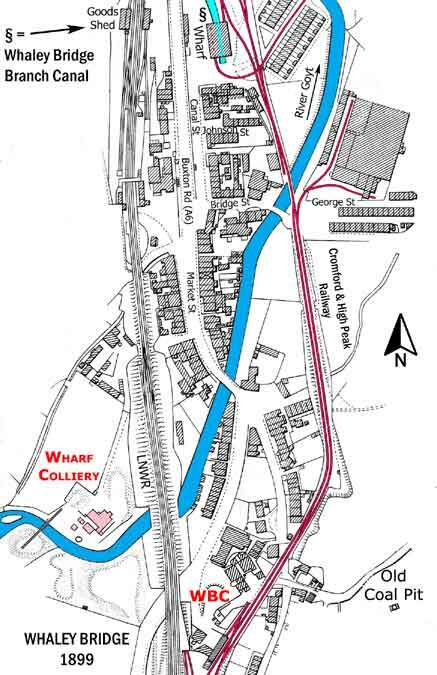 The colliery marked 'WBC' on the above map, south east of Wharf Colliery, was Whaley Bridge Colliery. This was comprised of several adits and shafts to the east of the river Goyt and it was opened in 1815 by Thomas Gisborne as the Waterloo Pit. Following his death it was operated by his son, Thomas Guy Gisborne. In 1866 it was bought by the Buxton Lime Co and in 1891 this became part of Buxton Lime Firms Co. Early in the 20th century it was employing about 110 men but it closed in 1911. There was possibly a loading facility with the nearby Cromford and High Peak Railway. Another noteworthy coal mine in the vicinity was Lady Pit of the Beard and Bugsworth Colliery group owned by Levi & Elijah Hall, which was situated at Gowhole near Furness Vale to the east of the Peak Forest Canal and the river Goyt. It was sunk in 1816-18 on the Beard estate belonging to the Duke of Devonshire. In 1896 this pit employed 36 men and it closed in 1903 because it was exhausted and could no longer compete with superior quality coal brought in by rail from Lancashire and Yorkshire. Beard was to be the terminus of the Duke’s intended tramway for which he obtained an Act in 1816 (Note56 George III Cap. 29: An Act for making a Railway or Tramroad from Peak Forest to Beard, and from Peak Forest aforesaid, to or near to Woodlands, all in the County of Derby.) but it was never built. In May 1832 the committee of the Peak Forest Canal Company agreed that the then owner, George William Newton, could build a wharf at Furnace (Furness Vale) on the towpath side of the canal, this to be sited on a short private arm of the canal. The purpose of this wharf was to load coal from Lady Pit into boats transported there by means of a tramway, which would have necessitated the construction of a bridge across the river Goyt. In the event, none of this was built.